Photo by KEVIN FULLER RYCE is serving a fusion of Caribbean cuisine and soul food with dishes like jerk chicken with Jamaican sweet dumplings. 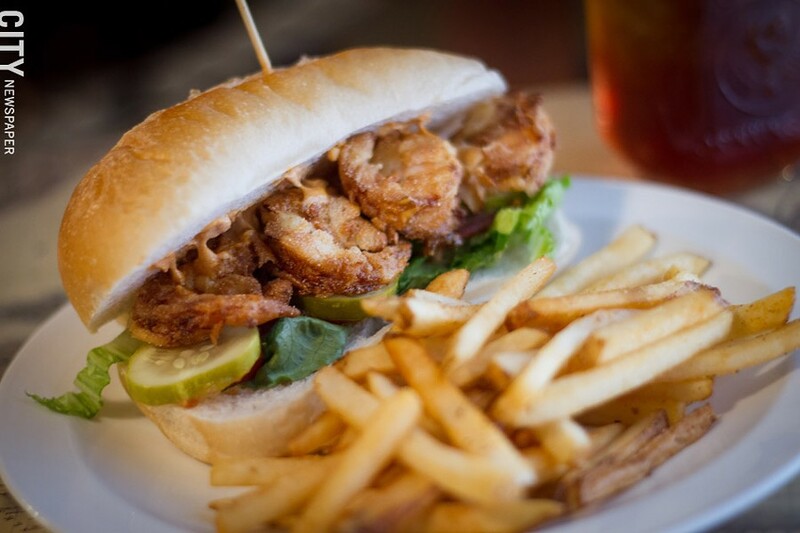 Photo by KEVIN FULLER The shrimp po' boy. Photo by KEVIN FULLER The Rochester Youth Culinary Experience is a fully functioning restaurant run by East High School students, like 17-year-old Henry Davis. 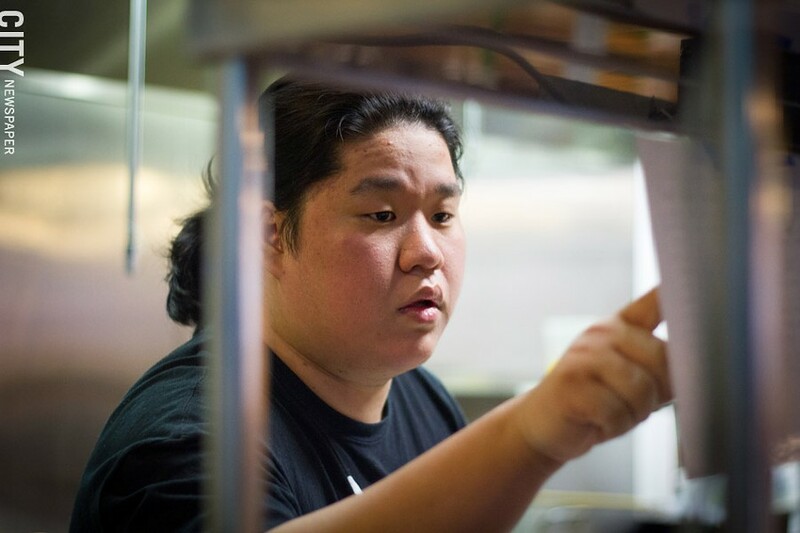 Last March, CITY wrote about the Rochester Youth Culinary Experience program and its vision to open a fully functioning restaurant, run completely by East High School students, in Village Gate. On February 2, that vision became a reality. RYCE (pronounced "rice") opened in the space between Salena's Mexican Restaurant and Nox Cocktail Lounge, and is serving Caribbean cuisine and soul food. Kelly and Aaron Metras, owners of Salena's and partners with Nox, still sit on the RYCE board and are actively involved in advising and training the students on the ins and outs of restaurant ownership. They aren't the only ones, however. Management from other local restaurants have reached out to Metras and inquired how to become involved with the program. "Taking on mentors will allow us to get more one-on-one time with each student," Kelly says. The restaurant is currently only serving dinner, but there are hopes to open for lunch the last week in February. Menu items were completely created by the program's students, who chose to focus on cuisine they were familiar with and often pull from family recipes. The Jibarito ($14) sandwich uses fried plantains as the "bread" and is filled with pulled pork, Swiss cheese, tomatoes, lettuce, and a sriracha mayo. 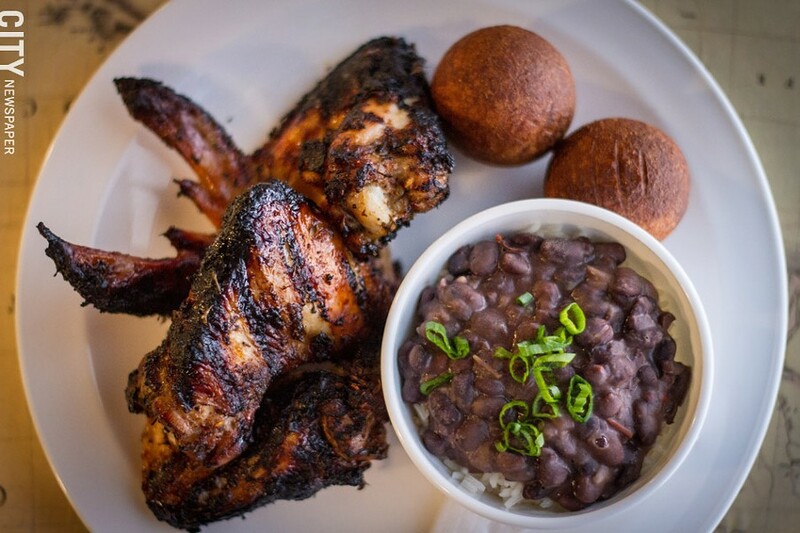 The RYCE Jerk Chicken ($15) is served with Jamaican sweet dumplings, and each entrée comes with a choice of side, like the coconut rice and black beans or mango coleslaw ($3 for just the side). A variety of smoothies ($6) and freshly squeezed lemonade ($3) are available to wash it all down. The restaurant space features an open kitchen and seating for around 60 people, with an outdoor patio that will open when the weather gets warmer. "The energy and tenacity these students have is incredible," Kelly says. RYCE is still currently taking donations, and more information on how to donate along with the progress of the program can be found on its website. RYCE is located in Village Gate at 302 North Goodman Street, and is open Monday through Sunday, 4 p.m. to 9 p.m. 471-5533; ryceroc.com. Marty's on Park (703 Park Avenue) has started serving brunch on Saturdays and Sundays from 10 a.m. to 4 p.m. Menu items include breakfast sandwiches, house-smoked pastrami hash, and sweet potato pancakes. Prosecco, Bellini, and beer specials will also be available. The Flower City Arts Center (713 Monroe Avenue) will hold its annual Chili Cook-off on Saturday, February 25, from 4:30 p.m. to 7:30 p.m. Local restaurants like DogTown, Marshall Street Bar and Grill, and Owl House, among others, will compete for top honors. Tickets are $25 and come with your own ceramic bowl. Tickets and more information at rochesterarts.org. The Junior League of Rochester will host the Battle of the Brunches at The Arbor Loft (17 Pitkin Street) on Saturday, March 4, from 11:30 a.m. to 2 p.m. Some of Rochester's best breakfast spots, including ORBS Restaurant and Bar, Donuts Delite, and The Red Fern, will serve tastings of their most popular brunch items. Tickets are $35 for regular admission and $50 for VIP. Those can be purchased at battleofthebrunches.com. Neighborhood Nosh, presented by Sip and Savour Rochester, Nosh, and Three Heads Brewing, will take place on Monday, March 6, at 6:30 p.m. at Nosh (47 Russell Street). The four-course pairing menu will be created by Joe Zolnierowski from Nosh and paired with brews from Three Heads. Tickets are $50 and can be purchased at eventbrite.com. Tony D's (288 Exchange Boulevard) has reopened in Corn Hill Landing. Tucker's Diner and Bakery (303 Macedon Center Road) has opened in Fairport. Country Sweet Chicken & Ribs (1691 Mt. Hope Avenue) has reopened after being closed for renovations. The Beale New Orleans Grille & Bar (689 South Avenue), The Original Mac & Cheez (77 East Main Street), and McAlister's Deli (3020 South Winton Road) have all recently closed.